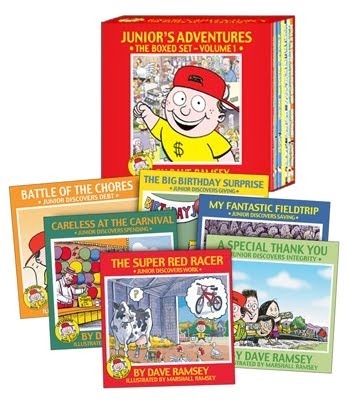 Nationally syndicated radio talk show host and New York Times best-selling author Dave Ramsey has created a line of products for kids that takes his financial expertise and applies it to kids ages 3-12 in a fun, easy to learn experience. 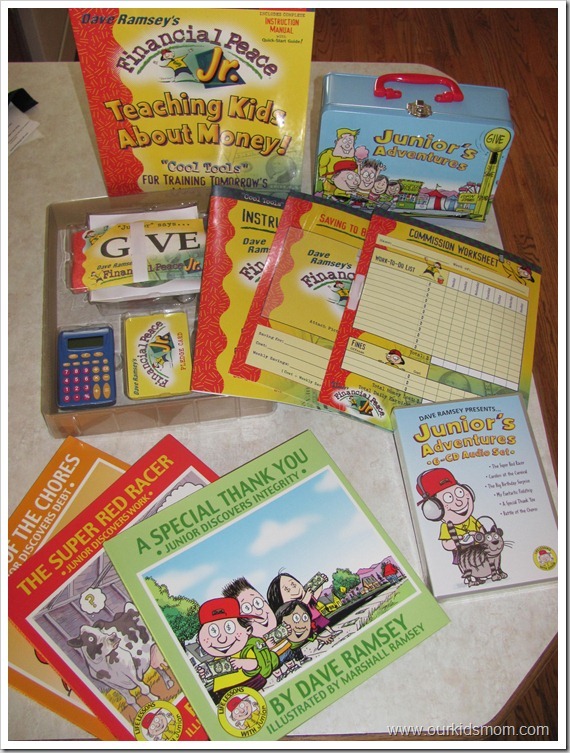 The book series is based on Junior, a young boy who learns the valuable lessons of giving, sharing, and spending. There are six illustrated books in the series that cover lessons such as “Junior Discovers Spending,” “Junior Discovers Work,” and “Junior Discovers Integrity.” The books are also available in an audio format and come in a cool aluminum lunchbox with Junior and his friends on the front. They are the perfect companion for travelling and bedtime story readying. 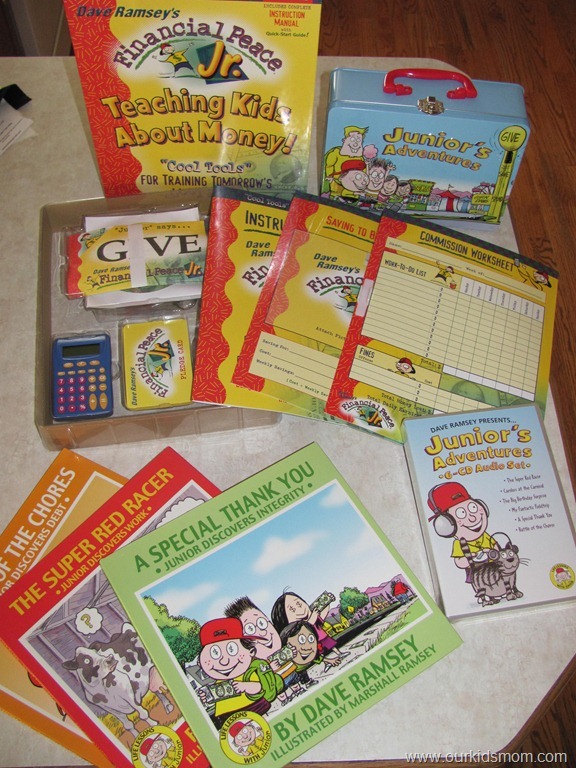 Dave Ramsey has also taken his acclaimed Financial Peace University series and made a kid’s version that helps parents teach their children how to practice the principles that they read about in Junior’s book series. 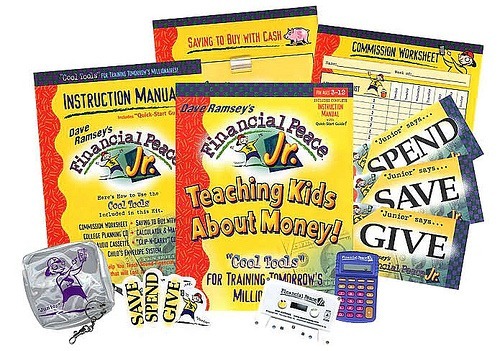 The Financial Peace Jr. kit comes with dry-erase boards to keep track of savings and commission; a coin purse; magnets for giving, saving, and spending; a kid’s sized calculator; envelope system; and an instruction manual for parents. 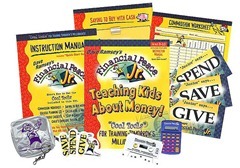 Financial Peace Jr. is a great way for parents and kids to grow closer and learn the value of money together. My husband and I are firm believers in Dave’s system. Although we did not attend Financial Peace University, my husband read the book (several times through) and we followed most of the advice in it. For about 2 years 4 months my husband worked his tail off while I tried my best to make our budgeted ends meet at home (for clothing, groceries etc). We didn’t live off of beans and rice, rice and beans… but we also didn’t eat steak dinners every night. We also cut out most of our eating out and tried to obtain free or almost free entertainment. We were able to pay off all our debt (around $37,000) except the house in that time. Because of Dave’s advice we established a decent emergency fund since then and when our central air went out in the house last month, we had the cash to replace it. Although it hurt, we had the money. We have been trying to pass along this valuable knowledge to our children. We want them to live a life like no other… and to start that life early. Hopefully they are listening and hearing our tails of “poverty”, debt and struggle and taking them to heart. We know that our oldest, Kaytlin, has listened. She has decided to live at home while attending college. She works at the book store and pays for her classes in cash. She is due to graduate with an associates in the spring… with no debt. With the tools, advice and reading material in the Financial Peace Jr. kit we hope to start Emma and Ethan super early on a road to no debt. At the ages of 4 and 3 they both know that we cannot have everything we want… that things cost money and sometimes they cost too much money. Emma is learning to read the prices on items at the stores and knows that $15 is a lot more than $5. Soon they will start to earn a little money by doing what chores they are able to and will learn that although spending is fun, we also need to save. The spirit of giving runs full circle and they will be encouraged to share their “wealth” with others also. This kit is a fabulous teaching aid to help guide our future generation into an adulthood of owning their possessions. Nothing feels worse than having an object “own” you… where every bit of energy you have is put into working to pay for it. There’s no feeling in the world like paying cash for something you have wanted for quite some time. 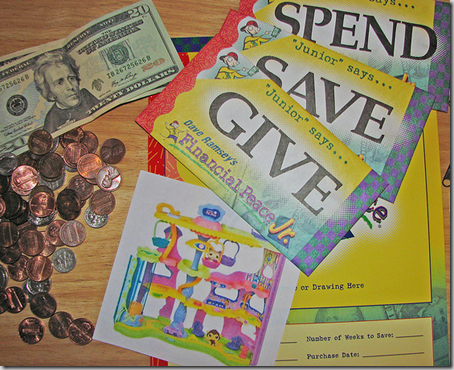 ONE OurKidsMom reader is going to win the Financial Peace Jr. Kit, audio books and a variety of hardback books! This giveaway ends at 12:01 AM EST on September 22, 2011. I like that he lists trusted companies on his site. I really want the full system my local church does a program by Dave Ramsey and I’d love to go sometime! Thankful for Dave Ramsey’s advice. Hoping to lead by example for my kiddos. I learned that he had a great book out and I ordered it Entire Leadership. I Like the Real Life…Real Stories section. I learn from what others are experiencing. I’ve watched Dave on TV, and he makes a lot of sense. I like that they have online budgeting program. I like how organized and put together his program is. I think this would be very beneficial for my two little ones, especially my daughter who wants to spend spend and SPEND without understanding. I would like to take the financial peace university online course. I Like the Real Life…Real Stories section. I learn from what others are experiencing. I like his budgeting tools on the website. I would like to have the EntreLeadership book. I would love to try the budgeting software. I love the baby steps! I would love to have the Designer Envelope System and Coupon Companion (Blue/Brown) and the Dave Ramsey’s Personal Finance Software – Immediate Download. I learned that he has alot of different curriculums for kids of all ages. I like that you can find radio stations to listen to his show one! Just gave a Biblical finance lesson to the ladies at our church…. would love to have this to help our kids!!! I like the way the program for the younger kids is set up. I do believe that if they are taught from the beginning the proper way to handle many that they will hopefully avoid the traps that so many of us have fallen into. I know that for myself, I was taught nothing about savings or credit or debt. My husband and I have learned the hard way and are diligently working to correct our mistakes and teach our kids a better way. I have used some of Dave Ramsey’s books for myself, and I would love the opportunity to have him explain finances to my daughter. I’m sure she’d be much more responsive to books aimed toward children written by anyone else than her mother. She tunes me out lol! 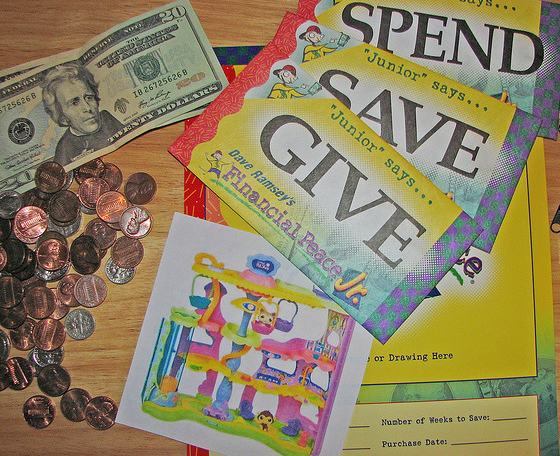 Foundations in Personal Finance is the perfect curriculum for homeschool high schoolers! Since this is not something that I was taught and as a result, struggled for three years to pay off my debt, I’ve made this a priority for my children. The program seems to be easy to understand for kids and look forward to sharing this with them! I am impressed with his site and will have to look into his site further. He is a very smart guy with lots of great tips I wish I would have learned when I was a kid. Thanks for the info. I like how it has question and answer areas of the website for specific financial situations. I think it’s cool that there’s a church leaders section on the website. He has simple products for young children. I like the Generation Change: A Teen Study. Luv that he teaches children how to handle money at a young age, as parents we all try but to have it out in front of them is great! I have done the adult version at church but did not know they had one for children. This is perfect for any family. I’d like to get the Total Money Makeover book. I would like his new book EnteLeadership. I would like to try the Designer Envelope System and Coupon Companion (Blue/Brown). Count me in! Looks like I have some reading today! I learned our economy is no longer in a recession and hasn’t been for some time. I love the JR kit and didn’t know that it was available. I’m a huge fan of Dave Ramsey and I love everything he has to offer. I love the fact that I can listen daily and in real time, his radio shows from his website. I’d love a copy of the Total Money Makeover book. Hello! This is my first comment here so I just wanted to give a quick shout out and tell you I really enjoy reading your blog posts. Can you suggest any other blogs/websites/forums that deal with the same topics? Appreciate it! Would love The Total Money Makeover book! I like the tools tab with the How to get out of debt tab. I’d like to have the Couple’s Bundle! Our local bank actually sponsors a Dave Ramsey course twice a year and I finally got the nerve and made the commitment to get into this and I just finished week 2 (or baby step 2) and I actually finished baby step 1 which I’m really proud of. Even better is that I brought my kids to learn as well and they really love it! I know the jr. kit would be a great inspiration for them! Dave Ramsey gives such great advice on being frugal and living a debt free lifestyle and I believe we should start early and teach children at an early age. Dave gives some good advice on how to sell your home at top dollar even in today’s down market. Thank you for the opportunity to win this great book. My kids could sure use it. I would love to start his Financial Peace University.